Ocean Park is Hong Kong's most popular theme park. It is currently undergoing serious expansion, doubling the number of attractions, partly to compete with Hong Kong Disneyland which opened in 2005 on Lantau. In fact, Ocean Park is ranked 7th most popular theme park in the entire world, I guess that Chessington World of Adventures occupies the top spot, followed closly by Dreamland Fun Park in Margate. 1. The pandas are rather sweet, and you can see why they are so popular. They're kind of like animated toys. 2. Chinese sturgeons are not at all sweet. I think fugly might be a more appropriate description. The info boards told us that they were bottom feeders, so of course Ross wanted to make sure they weren't going to feed on his bottom. Ha ha. 3. Sticking some sturgeons in Ocean Park is not really going to make up for the habitat loss inflicted by the damming of the Yangtze river. 4. Beijing bestowed a gift of 5 sturgeons on Ocean Park in August, to mark the opening of the Olympics (5 sturgeon, 5 Olympic rings) However, the smallest one was found dead the next day, after being attacked by a barracuda. Poor sturgeon! Ocean Park management were criticised for this, but insisted that the two species had been put in the same aquarium on the advice of Beijing experts. 5. The rides look very cool. I think after a few beers they'd be even better. The rollercoaster kind of hangs out over the ocean, nice and scary. 6. 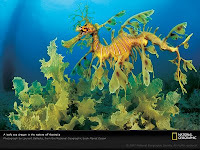 The Leafy Sea Dragon has narrowly pipped the seahorse to the post in the race to be ma favouritest sea creature. We saw quite a few of these in the aquarium. Actually I'm pretty sure it's the best aquarium I've ever seen - cow-nosed rays, reef sharks, barracuda, a turtle, banner fish, angel fish, moray eels, loads of fascinating beasties.